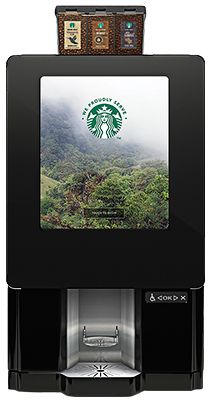 With engaging content on its enhanced 17” screen and the versatility to add a customer payment option, Serenade™ single-cup brewer brings the brand to life with a genuine Starbucks Experience, that’s conveniently self-serve. Krea is the ideal solution for small/medium hotels, reception areas and locations where quality coffee, reliability and contemporary design are paramount. Benefitting from Necta’s latest espresso brewing and instant freemix technology you can expect the best quality drinks all day long. Completely customization screen ready for logo’s or dealership advertisements! A hybrid Bean to Cup Solutions! An Environmentally Friendly and Sustainable Brewer. Freshly brewed coffee available 24/7. Ideal for the most demanding coffee consumers. The TOTAL LITE has a 3 bean hopper, 2 soluble bins and interactive screen. 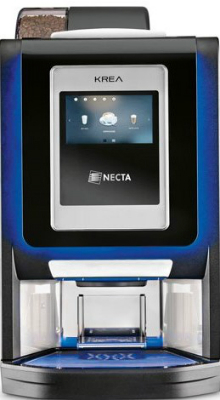 A fully customizable, super automatic, stainless steel commercial coffee machine. Waiting for a coffee is a thing of the past. Precise controls over all the variables in the brewing process including the all important dwell time, ensures that the ideal extraction of ONLY the most appealing flavors within the roasted bean happen consistently, every cup.